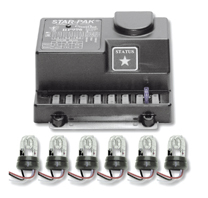 This kit incorporates six outlets with 24 customer selectable flash patterns all in a 90 watt system. The multiple strobe head combinations can be enabled. It also has Customber selectable Day/Night mode and features power reduction to operating heads in case of head failure, RFI protection, cooling fan and Visual System Diagnostics (VSD). The kit ships complete with power & control leads and instructions. The standard kit includes one 90 Watt remote power supply, six clear strobe tube assemblies, six 15' cables with attached connectors, one lighted toggle switch.